1Department of Physics of Complex Systems, Weizmann Institute of Science, Israel. 2Current address: Physical measurement Laboratory, National Institute of Standards and Technology, Boulder, USA. Quantum systems have been extensively studied in the past few years as possible ultra-efficient computers. Such systems have to be as isolated as possible from their environment in order to prevent it from “measuring” the state of the quantum computer, a process which would render the computer classical. Candidate systems that were experimentally studied thus had to be sufficiently isolated from their environment while allowing for a high degree of controllability. In addition, active methods were developed, in which special quantum states and control techniques were engineered and helped mitigate the effect of noise. Many such techniques, such as dynamic-decoupling or decoherence-free subspaces, were experimentally implemented with great success, increasing the coherence times of quantum systems by many orders of magnitude. Other methods, such as Quantum error-correction codes, have had proof-of principle demonstrations but hold the promise of being able to reject noise in a way where quantum super-positions of very large systems will be maintained coherent for as long as necessary – one of the key requirement from a quantum computer. A different quantum technology which has seen great progress in recent years is that of quantum metrology. At face value, quantum sensors seem to be exactly antipodal to quantum computers. Here, quantum systems do have to couple to their environment in order to sense some aspect of it. However, as in many seemingly contradicting concepts there can also be a lot of common ground. For example, environmental noise (i.e. that part of the environment which you don’t want to measure!) is a foe of both quantum sensors and quantum computers. Can we therefore use the techniques that were developed to help quantum computers overcome the harmful effects of noise to improve on the measurement precision of quantum sensors? The answer is yes, and with great success! Along these lines, different dynamic modulations schemes, originally used in dynamic decoupling were used for the measurement of alternating signals. This way quantum lock-in amplifiers as well as quantum noise spectrum analyzers were demonstrated. In a recent experiment in our lab at the Weizmann Institute of Science, we used the powerful technique of decoherence-free subspaces in order to measure the very weak magnetic interaction between two electrons that were separated by more than two microns . Figure 1: An artist impression of the spin-spin experiment. Two electrons are placed two microns away from each other. The magnetic field emanating from one electron interacts with the spin of the other electron, resulting in a change of the spin-orientations. Electrons, like many fundamental particles have an intrinsic magnetic dipole moment which is aligned with their spin. These tiny magnets have a magnetic field that decays as the cube of the distance from the electron. To illustrate, the magnetic field of a single electron two microns away from it, is as small as the earths’ magnetic field at 10 times the distance to the moon. When two electrons feel each other’s magnetic fields their spins interact as magnets do: their opposite poles will attract, their identical poles repel in a way that torques will be applied and the two spins will respectively rotate due to this interaction. 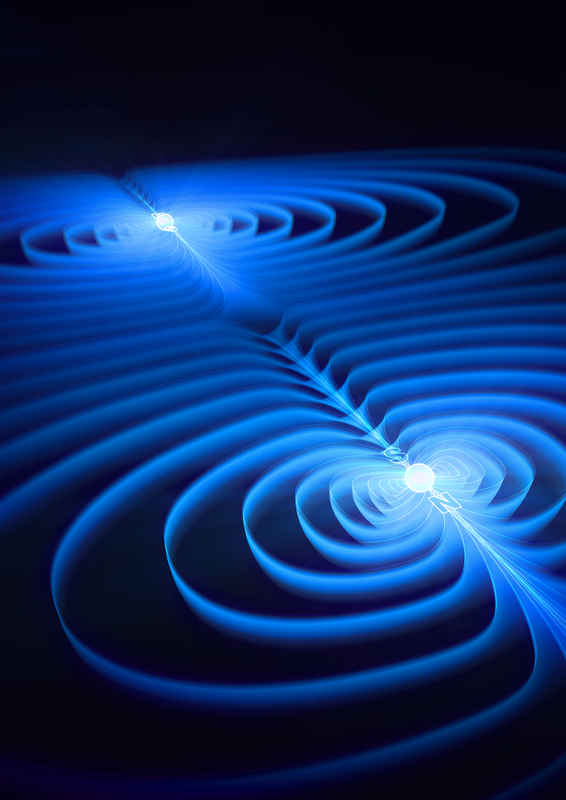 The magnetic interaction between two electrons was never directly observed before. At short atomic distances, such as that between the two electrons of a Helium atom, the magnetic interaction is large enough to be easily measured. Unfortunately, at these distances, it is overwhelmed by the much larger exchange interaction between them which is the result of the interplay between the strong Coulomb interaction between the electron charges and Fermi’s exclusion principle. At large distances, where the exchange interaction is negligible, the magnetic interaction between the electrons is also very small. At a distance of two microns for example, the rotation rate the two spins impose on each other is on the order of one rotation every four minutes. This interaction is way too small to be measured due to typical magnetic noise in labs. Figure 2: An image of the trap in which the ions were trapped for the duration of the measurement. The image is taken through one of the ultra-high vacuum chamber view-ports. This is where techniques, borrowed from quantum computing science come to the rescue. We have placed the spins of two trapped Sr+ ions in a decoherence-free subspace that was completely immune to the effect of magnetic field noise. While being immune to noise, this subspace still allowed for the slow and gentle two-spin correlated dance to be performed without interference. Under the protection provided by this technique we could allow the electronic spins to rotate coherently for 15 seconds, after which we measured their collective rotation of more than 20◦. We also changed the distance between the electrons and verified that the interaction between them varies inverse cubical with their separation. Thus, almost a 100 years after the discovery of the electronic spin, we were able to cleanly observe the interaction between two such tiny magnets. This measurement bears importance that reaches beyond its demonstrative nature. This is because some hypothetical anomalous spin forces are speculated to modify the interaction between electronic spins at large distances. The motivation for the introduction of these anomalous forces is due to their ability to explain the weakness with which certain symmetries are broken in nature. The experimental bound on the strength and range of these hypothetical fields is therefore important. The use of quantum error-suppression schemes for the benefit of precision measurements is a fast developing area of research. With the advent of experimental quantum error-correction codes, another opportunity will emerge to apply these codes towards the detection of small and highly correlated signals [2-5]. 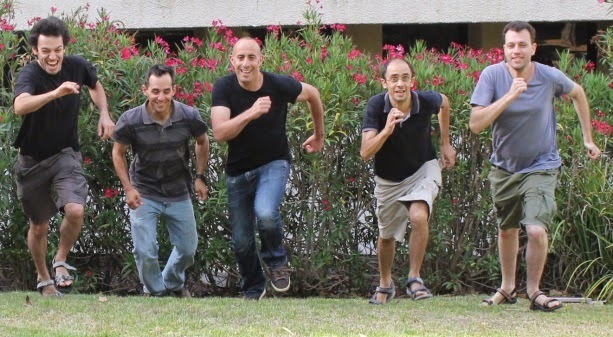 Shlomi Kotler, Nitzan Akerman, Nir Navon, Yinnon Glickman, Roee Ozeri, "Measurement of the magnetic interaction between two bound electrons of two separate ions". Nature, 510, 376 (2014). Abstract. Roee Ozeri, "Heisenberg limited metrology using Quantum Error-Correction Codes". arXiv:1310.3432 [quant-ph]. G. Arrad, Y. Vinkler, D. Aharonov, A. Retzker, "Increasing Sensing Resolution with Error Correction". Physical Review Letters, 112, 150801 (2014). Abstract. E. M. Kessler, I. Lovchinsky, A. O. Sushkov, M. D. Lukin, "Quantum Error Correction for Metrology". Physical Review Letters, 112, 150802 (2014). Abstract. W. Dür, M. Skotiniotis, F. Fröwis, B. Kraus, "Improved Quantum Metrology Using Quantum Error Correction". Physical Review Letters, 112, 080801 (2014). Abstract.